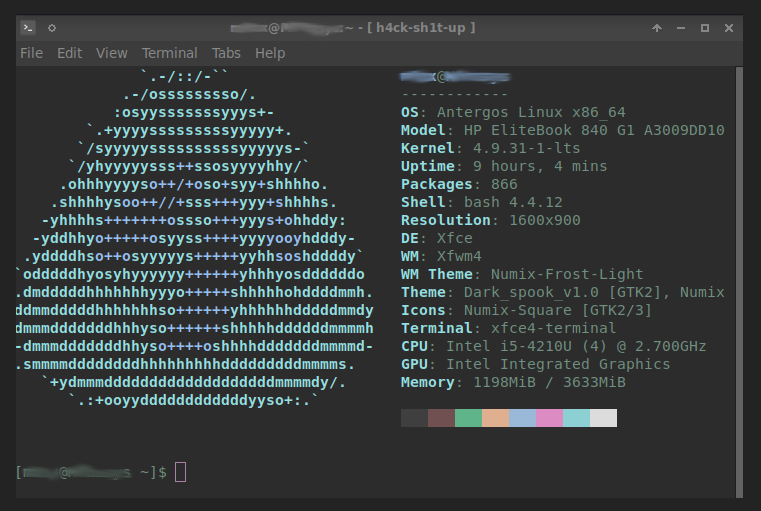 How to display system info in terminal. Hello, here is an easy one for you guys- How /where do you get the fancy terminals with system info and “graphics” made out of symbols and letters? 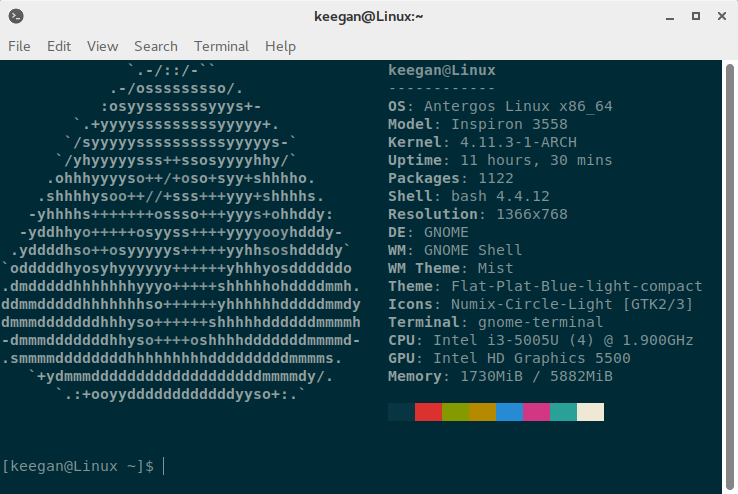 I’ve been looking at pictures of peoples customized desktops and many have those cool looking terminal windows and now I want one for my self to go with my newly installed Antergos <3 -but where/how to get it? Is it a special terminal i have to download, or some settings I’ve missed out on? I’m on XFCE. Thank you. Simply install "Neofetch’ from Pamac. Just glad I could help! I’m just curious now. 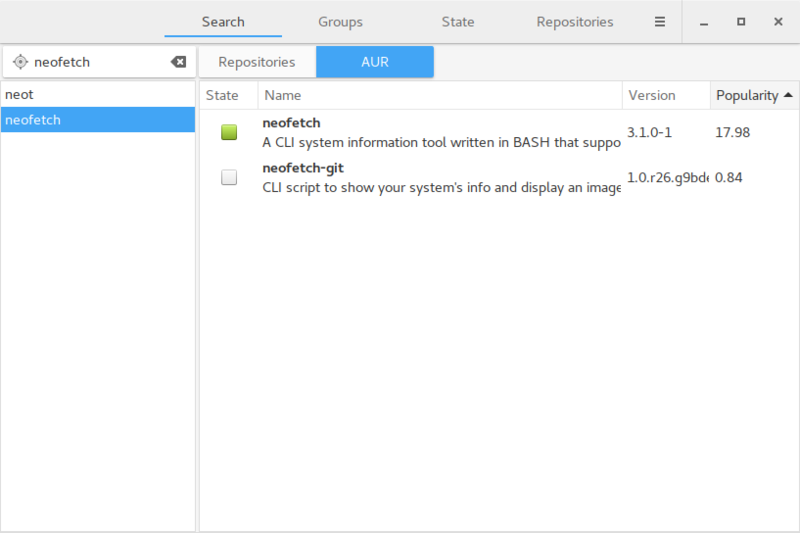 What does your new and improved terminal look like? (If you can’t upload an image, simply upload it to here and put a link to it in your post). @A-User Here is mine: http://i.imgur.com/9If9S7y.png -now, the adventures of making my own graphic. Neofetch will by default create a config file at $HOME/.config/neofetch/config and this file contains all of the script’s options/settings. The config file allows you to keep your customizations between script versions and allows you to easily share your customizations with other people. You can launch the script without a config file by using the flag --config none and you can specify a custom config location using --config path/to/config. Thank you for all of the helpful info! I really like your bright blue text . How can I get my text like that? So am I… sort of. Neofetch is also in Pamac, only it is located in the AUR. I misunderstood your last post. Nice! I really like both of your terminals! By the way, does anyone here now how to set a custom image for neofetch to display in place of the Antergos logo? It just seems kind of fun to be able to play around with it .